I was recently asked to develop installers for some of our web applications, so they could be installed in a production environment. I needed to give our engineers a “package” that could be run on a fresh install of Windows Server 2008 R2, and would deploy the entire solution. I want to write about how the technologies I used to achieve this, focusing on Web Deploy, and how I arrived at an end to end solution, with help from MSBuild, Powershell, and some simple command scripts. Our first task is to build our Web Deploy packages as part of our nightly CI build. Vishal Joshi has written a great article about this here. The approach we’re taking here is to compile the web application project and then publish it to a physical filepath. It’s good to remember that when you can specify a configuration for compilation, you can have your specific Web.config that provides the correct parameters for that configuration. I’ll talk more about the Web Deploy syntax later, but the deployment above will sync only the content in the source path with the content on our destination server using the contentPath provider, no permissions or IIS Setup work is done here, and this is because our site is already up and running, our environment is configured (permissions,web.config e.t.c) and all we’re doing here is syncing our “old” build files with our new ones. It takes the site that we publish to our C:\build\WebAppServer\client folder, and performs a sync with the site at c:\WAS on 192.168.1.10. Once we have verified and signed off the build we can use the /T:Package command with MSBuild to package our build. This gives us the zip file we need to pass to the engineers. To install our web applications onto a new install of Windows Server 2008 R2, we’re going to need to configure the box and install some prerequisites, including Web Deploy itself. I’m going to demonstrate some of the parts of the Powershell script we use to do this. This Powershell code takes our script arguments, and steps through them adding them to a structure we can reference later on – in this case to specify the install location. The script installs the .NET Framework, Application Server, and Web Server roles for us, and we’ve also included logging information for the engineer using the –LogPath switch. Where $PATH_WebDeployInstall contains the full path and filename of our Web Deploy msi file. The /q parameter is a “quiet” switch which means the installations run silently as background processes with default settings. NOTE – Web Deploy installed with default settings will NOT include the remote management service if you need to deploy sites remotely to that server – although hedge my bets that there is a switch to pass to the msi which will install in a “Complete” fashion. We can also use Powershell registry commands to store the install path of the application so that when we come to “upgrade” our application, we know the physical sync path to pass to Web Deploy. So we’ve now configured the server, installed all the prerequisites, and stored our install location. We’re at a stage now where we can deploy our web application, we’re going to use two different command scripts to do this. Now our server is configured we can install our web application using Web Deploy. You can use the deploy cmd scripts that the package build generates, and you can pass any number of Web Deploy arguments to those standard scripts. I’ve written a slightly different script here. -presync:runCommand="md %1 & %SYSTEMROOT%\System32\inetsrv\appcmd add site /name:WebAppServer /bindings:http/*:85: /physicalPath:%1"
The command will install our web application into the location we specified, installing dependencies, configuring ACLs, certificates, and gladly doing all the heavy lifting for us. Because of the Web Deploy “sync” behaviour, the approach above can be used to roll back a site to a specific version just as easily as installing a new version, and in a live environment, if something goes wrong, it can be extremely useful to have that ability. There are many ways to skin a cat with Web Deploy. You can use the API with VB.NET or C#, you can use it inside IIS to export or import applications, and you can use it as I’ve done here, in a scripted manner with Powershell and command files. 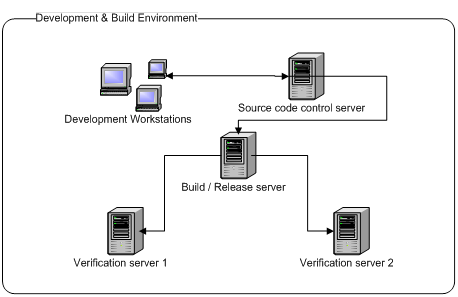 Hopefully this gives an example of the latter approach, and how you can use Web Deploy in your CI integration and testing, through to delivering maintainable installers for production environments. I’d like to say a huge thanks to Bilal Aslam, Vishal Joshi and the whole Web Deploy team for all their assistance. I came to Web Deploy knowing nothing about it, and they were extremely helpful – thanks guys. The ccnet.config screenshot should read 192.168.1.10, my typo - sorry about that. This article has a lot of useful information, thank you. Just started digging into web deploy, but ended up learning about appcmd ;) Sweet, another way to skin the cat.